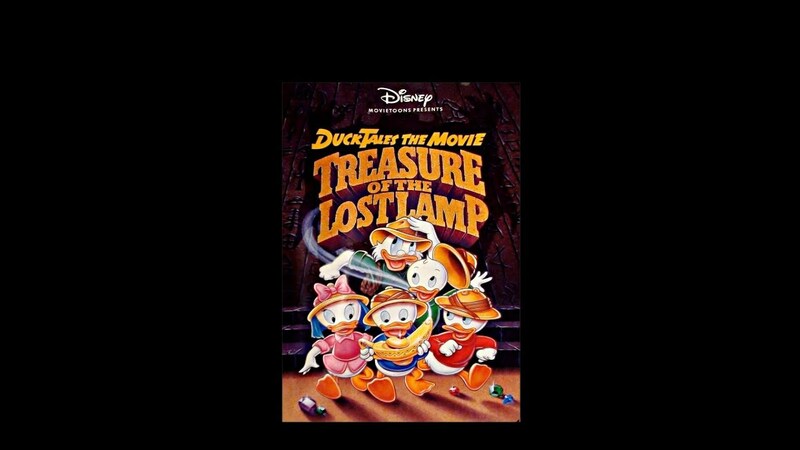 DuckTales the Movie: Treasure of the Lost Lamp marked the first theatrical animated movie by The Walt Disney Company that was not part of their animated feature canon (being produced by Walt Disney Animation, France S.A., which would later transfer from Television Animation work to Feature Animation work), and their first movie based on one of their television shows. It is based on DuckTales (1987) and was released shortly before the series' last few episodes originally aired. It was also the only film released under the short-lived "Disney Movietoons" division. The film opens on Scrooge, Launchpad, Huey, Dewey, Louie, and Webby arriving at a dig site where Scrooge's diggers have found a map to a treasure Scrooge has been seeking for forty years - the treasure of Collie Baba and his 40 Thieves. Unbeknownst to them, Dijon, a digger with a severe case of kleptomania, is working for an evil sorcerer named Merlock, who is also seeking the treasure so that he can get his hands on a magic lamp that Collie Baba stole from him so long ago. Just as Scrooge and company find the treasure, Merlock steals it right from under their beaks. However, before he could do that, Webby found the lamp Merlock was seeking, which Scrooge allowed her to keep as a toy for her tea party set. Thus, Scrooge and company end up coming home with the very thing Merlock was looking for. Despite that however, fans of the series were happy it got a movie at all, and cite it as a great cult classic nonetheless. Neither Bubba or Fenton/Gizmoduck appear in the movie. Flintheart Glomgold, Magica de Spell, and the Beagle Boys, the series' main villains, are absent too and instead get replaced with Merlock and Dijon. Agony of the Feet: Launchpad gives a kick to the top of the pyramid buried under the sands after it trips up his camel. Predictably, this leads to a massive pain in the foot. Air-Vent Passageway: While infiltrating the Money Bin, Webby has to crawl through the air vent into the security room and then open the door for the boys. Animation Bump: This movie features some of the most beautiful Disney animation of the early 1990s. Animorphism: Merlock's main power. Over the course of the movie he changes into many animals, including a vulture, a rat, a bear, an eagle, a puma, a cockroach, and a griffon at the climax. Amplifier Artifact: The villain Merlock possesses a magical amulet that, when used in conjunction with the Genie's lamp, lifts the Three Wishes restriction, essentially giving him limitless Reality Warper powers by proxy. In the movie, Genie mentions that Merlock wished for Atlantis to sink and Mt. Vesuvius to erupt. The Comic-Book Adaptation adds that Merlock was also responsible for the creation of anchovy pizza. When Scrooge learns the extent of Dijon's wish for his fortune, he discovers that Dijon owns his mansion, his factories, and even his spat collection. Baleful Polymorph: Dijon gets turned into a pig for his treason as Merlock's first wish when he retrieves the lamp. Ball of Light Transformation: Unlike other genies who would rather turn into smoke, the genie here (and anybody he brings inside the lamp with him) becomes a small cloud of sparks or a mote of light to enter/exit the lamp. Be Careful What You Wish For: The Genie explicitly warns the kids about this after Webby wishes for a baby elephant. Yes, she has the elephant, but she has no way of hiding it from Scrooge or Mrs. Beakley. In fact, when the elephant inevitably starts breaking things, Huey has to waste one of his wishes just to get rid of it. Become a Real Boy: Scrooge uses his final wish, to give Genie a real life of his very own. The Lamp crumbles to dust without the magical being. Scrooge: (confused) He has a bear? Genie: (panicked) He is the bear! Been There, Shaped History: As the Genie mentioned, the sinking of Atlantis and the eruption of Mount Vesuvius were the result of wishes Merlock forced him to grant. Benevolent Genie: The genie is a curious but good-natured fellow who even tells the nephews that he is "eternally grateful" when they first free him. He takes no pleasure in granting wishes that are liable to cause trouble or are otherwise harmful, but he can't resist for long before he is somehow compelled into bringing it into existence anyway. He even warns them early on to try and keep the wishes relatively subtle, as flashy displays of his magic invariably cause trouble. Not least of which is a former master of his, an immortal sorcerer who has a talisman that gives him limitless wishes and a very cruel nature. Two other wishes the genie was forced to grant him included sinking Atlantis back when it was a prime vacation spot after the sorcerer couldn't get a reservation, and causing the eruption of Mount Vesuvius (in his words, "And poor Pompeii! Mt. Vesuvius never would've blown its top if Merlock hadn't blown his!"). The genie openly weeps when recounting these facts. Big Bad Wannabe: The cowardly and greedy Dijon knows full well that he's just the lackey of the ancient sorcerer Merlock, but when he accidentally gets control of the genie's lamp he abandons his master and briefly takes over Duckburg. Merlock sneaks into the palace by hitching a ride with the Ducks and demonstrates who the real villain is. Brought to You by the Letter "S": When Dijon takes Scrooge's fortune, the dollar sign-like S on the front of the Money Bin (for Scrooge) turns into a D (for Dijon); this can be seen when Scrooge makes it there from the resort and before he runs into Dijon in the office. Came Back Strong: In a non-character example, when the Money Bin is restored to normal, it not only has its signature "S" logo back but now has a brand-spanking new golden plating. The Cameo: A portrait of Donald Duck appears on a wall in Scrooge's mansion after Louie wishes for Webby's toys to return to their lifelessness. Captain Crash: Launchpad, as in the series, but here given a Lampshade Hanging as Launchpad admits that he's never had full flight classes, only a crash course. Catch-Phrase: Genie says "Shablooey!" whenever excited or alarmed. Chekhov's Gun: The boys' marbles, which helped them get through Collie Baba's Booby Trapped pyramid also helps them disable the Money Bin's alarms and later knock the lamp out of Merlock's hands. The Chew Toy: Merlock may be evil, but he also goes through a good deal of physical humiliation before he gets the lamp. This includes getting swallowed by a stuffed tiger, swatted by Mrs. Beakley, zapped by a laser, and stepped on. Chickification: Mrs. Beakley suffers from this. The reason Mrs. Beakley was hired as the triplets' nanny was because she was the only one "tough enough" to handle the little terrors, and for the first few episodes, she lives up to the job: breaking characters out of prison, escaping giant penguin-eating walruses, chariot-racing Vikings... and by DuckTales the Movie: Treasure of the Lost Lamp, she's nothing more than a weeping fainting woman. Civilization Destroyer: The Genie explains that Pompei and Atlantis were destroyed by Merlock's wishes. 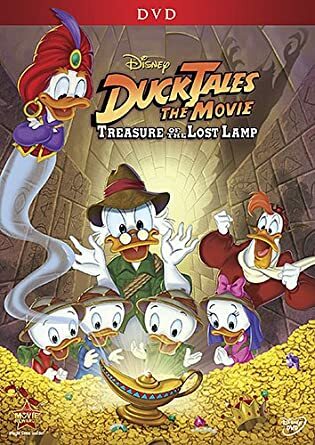 Colon Cancer: The poster implies the title is actually spelled as Duck Tales: The Movie: Treasure of the Lost Lamp, but most people prefer the alternate for obvious reasons. Complaining About Rescues They Don't Like: When Merlock crashes the Archaeological Society Ball in bear form, Genie tosses the lamp into a chandelier and drags Scrooge in with him. Scrooge starts complaining about being stuck in the lamp, even though he would've probably been killed by Bear-Merlock if Genie hadn't pulled him in. Genie: Do you have to yell at me all the time? Scrooge: I wouldn't even be in this mess if it weren't for you! Constantly Curious: Genie. Also an established bookworm. Covers Always Lie: The theatrical poster ◊, VHS ◊, and DVD ◊ covers all feature Scrooge wearing an Indiana Jones-style Fedora, which he never wears once in the entire film. Cutting the Knot: While breaking into the Money Bin (now under Dijon's control), the boys fail to navigate their way through the Laser Hallway to the alarm panel. Thus unable to deactivate the alarms, they simply destroy the panel from across the room with their marbles. Dark and Troubled Past: Genie heavily implies to Huey, Dewey and Louie that Merlock forced him to kill thousands of people. It does not show very much in the beginning, but as the story progresses it becomes apparent that Genie is so haunted by his past that mere shadows of birds and mentions of wishes are potential triggers. Darkest Hour: As the climax rolls around, Dijon gets the lamp and wishes his fortune... by taking Scrooge's. He takes everything from him: the Money Bin, his enterprise, even his house. What little money the team is left with had to be given up to get Scrooge back from Dijon's goons. And then Merlock takes the lamp and raises a giant castle in the middle of Duckburg. Webby does this twice with her wishes. For her first wish, she asks for a baby elephant, without considering how she's going to explain where said elephant came from to the grownups; in any case, the elephant quickly runs amok and has to be wished away. Later, she wishes for her toys to come to life without stopping to think that she might not be able to control them. They likewise run amok, and again a wish has to be wasted in getting rid of them. Genie: Big wishes always spells trouble! The bigger the wish, the bigger the trouble! Louie: You know he's right. One look at that elephant and Uncle Scrooge would want to know what's up. Genie: Anyone who sees it will! Before you know it, they'll be fighting over me, the wishes will get out of control, and I end up being buried for another 1,000 years! Louie: I haven't thought of that. Merlock himself suffers this as he finds out the hard way that transforming into a rat to search a house is not a good idea. When Genie convinces Dijon to be his master, he never imagined particular repercussions that could have, like Dijon wishing to have the fortune and estate of the world's wealthiest duck transferred to himself. Justified in his case, as he was desperate to get Dijon to not turn him over to Merlock and didn't have time to think about it quickly. Disc-One Final Boss: The first climax revolves around Scrooge and co sneaking through the Money Bin to swipe the lamp off of Dijon. The very second Scrooge gets it, Merlock takes control and the second climax begins. Disproportionate Retribution: One of the reasons Genie doesn't want Merlock to get his hands on the lamp is how fond he is of this. Unlimited power combined with slighting the angry wizard led to genocidal Disproportionate Retribution upon Pompeii and Atlantis. Repeated when he wishes for Scrooge's demise when he insults him during the climax. The Dreaded Pretend Tea Party: Webby wants to play tea party, and the genie (who is posing as a normal boy at the time) is pulled into it. Hilariously, Gene was fine with participating when he thought it was going to be like the Boston Tea Party but when Webby explains the actual game, he immediately complains of boredom. Unfortunately, his complaints backfire on him when his comments that Webby's 'party guests' are 'lifeless' gives Webby a bad idea. Durable Deathtraps: In the tomb, par for the course. Evil Laugh: Merlock loves indulging in these. The best is when he turns Scrooge's Bin into his fortress of evil and re-establishes his throne. Fish out of Temporal Water: Genie's first few moments free from the lamp are this. He quickly powers through the encyclopedia to catch up what happened while he was sealed away, though misses the revelation that the Earth isn't flat. "Boy, he has been in that lamp for a long time." Five-Second Foreshadowing: When Scrooge returns to the Money Bin after escaping Merlock, a "D" can briefly be seen on the building instead of the usual "S" mere seconds before Scrooge enters and discovers Dijon has used Genie to steal his fortune. Freeing the Genie: Scrooge uses his last wish to have Genie Become a Real Boy. Freeze-Frame Bonus: Try pausing the part of the movie where Merlock's wish to turn the Money Bin into a castle takes away Scrooge's entire fortune. You can see the handful of coins he scoops up in the soon-to-be-destroyed vault turn into black stones and fall into the new pavement that covers the stash as the vault floor prior to the building falling apart. Goofy Print Underwear: Dijon's, which we see a few time when his pants fall from putting too many stolen goods in them. Grail in the Garbage: Upon finding the lamp, Scrooge initially dismisses it as an old oil lamp that was hardly worth taking, unaware that it was actually the most valuable treasure in Collie Baba's hoard. Gray Rain of Depression: Just as Scrooge is loaded to a police van because he "illegally" entered his Money Bin (which is now Dijon's, thanks to him stealing the genie's lamp), a storm is heard. Then, at prison he mourns as rain falls and it finishes just as Scrooge makes a plan to infiltrate the Money Bin. Guile Heroine: Webby briefly uses her wits on Scrooge toward the beginning of the movie. When Scrooge is a little reluctant to let her have the oil lamp (despite having declared it "hardly worth taking"), she picks up a bejeweled crown and remarks that if he doesn't want her to have the lamp, "this is pretty too." Scrooge [handing her the lamp]: There, my dear. Don't say that your Uncle Scrooge never gave you anything. Happily Adopted: Genie after the final wish. The Heist: Scrooge and company work to break into the Money Bin after it's wished into Dijon's possession. Scrooge is very subdued after the first encounter with Merlock. He goes to sit on a log and when Launchpad expresses relief that at least everyone is fine, Scrooge brushes him off. He brightens a little after a talk with Webby, but even then his funk about losing the treasure gets in the way of a work day. Scrooge slumps when he's thrown into a jail truck and sees that his insignia on the Money Bin has been replaced with Dijon's, making it clear the building and the wealth inside it now belonged to him per the Genie. He's still in BSOD status when his family pays the bail and gets him out. Historical Rap Sheet: The villain Merlock was responsible for the sinking of Atlantis and the eruption of Mt. Vesuvius. Hypocritical Humor: When confronted by Merlock for not stealing the lamp, kleptomaniac Dijon frantically blames it's disappearance on Scrooge's gang, "those dirty thieves!" Dijon: And such sweet children. I ask you, Merlock, what is the world coming to? I Just Want to Be Normal: That's all the Genie ever wants. He eventually gets his wish, from Scrooge's last wish. Genie: It's not my fault Merlock's after me. I didn't ask to be Mr. Popular. All I wanted is a life of my own, like your nephews. Immortality Seeker: Merlock used to be the genie's master centuries ago before the genie's lamp was lost to him. The reason he survived for so long is because his first wish was for the genie to make him immortal. So, having already achieved this goal, his only real objective in the present is to retrieve the lamp and Take Over the World. Genie: What's more important — a fortune, or your life? Genie: HEY! It's not exactly a trick question! Is There a Doctor in the House? : Dijon utters this after a booby trap (a giant wheel that rolls across a room and up a ramp only to come back down) lands on him. Dijon: Is there a doctor in the pyramid? It Belongs in a Museum: Deconstructed by Scrooge. He wants the treasure of Collie Baba not to hoard all of it in his money bin, but to sell most of it to museums. When his nephews ask why, Scrooge says that the tax breaks and profits off of selling priceless artifacts is worth far more money than just keeping it in a zero-interest vault. Beakley: You think I'm crazy, don't you? Also Dijon to a very annoyed looking Merlock, after the lamp somehow escaped their loot. Jeweler's Eye Loupe: Naturally, Uncle Scrooge uses one to appraise the treasure. Large Ham: Merlock (remember, this is a character voiced by Christopher Lloyd we're talking about). Merlock: WHERE! IS! THE! LAMP?! Laser-Guided Karma: After Merlock previously stole Collie Baba's treasure from him, Scrooge later uses the lamp (the one item Merlock wanted from it) to wish it back. For an extra bonus, it ends up flattening Merlock in his rat form as it magically appears. Laser Hallway: Huey, Dewey, Louie and Webby have to go through one of these in the Money Bin. Living Forever Is Awesome: The nephews admire Merlock's skill as a wisher when they hear his first wish was immortality. The Genie then points out that when you're as evil and insane as Merlock is, immortality is not a good attribute. Macguffin Delivery Service: Like so many foes before him, Merlock concludes that the best way to find Collie Baba's treasure is to let Scrooge decipher the map and comb the desert for him. Meaningless Villain Victory: Merlock is one of the few villains to succeed in stealing a treasure out from Scrooge's bill...and is furious when the one thing he wanted isn't in the piles of loot. Morphic Resonance: Merlock retains his mustache and goatee in all of his transformations. The Movie: The only one that DuckTales ever got. There were plans for more, but when the movie did poorly at the box office, plans for any sequels got scrapped. That being said, all the Genie's wishes were undone when he was changed into a boy (as evidenced by Dijon changing back from being a pig), so it depends on if he landed before Scrooge's last wish. Perhaps as a Mythology Gag, Merlock DID return alive and well in a couple Disney video games. Aside from her unseen second wish, every wish Webby used made a delicate situation unnecessarily unstable. Her wish for a baby elephant nearly blew their cover on keeping Genie a secret from Scrooge, and her wish to bring her toys to life was the straw that broke the camel's back, arguably causing the chain of events in the rest of the movie. In her defence, she was also the reason they got hold of the lamp in the first place. When Dijon finds the lamp, Genie dissuades him from giving it to Merlock by pointing out that Dijon could wish for a fortune of his own. As Genie mournfully tells Scrooge later on; "I didn't know he'd wish for your fortune!" This also gets Dijon turned into a pig when Merlock gets the lamp himself. No Man Should Have This Power: Scrooge finally wins back the lamp for his final wish. He considers the genie as he is, is too dangerous. The potential for mischief and mayhem is enormous, and realizes any sane person would seal the Lamp at the center of the Earth where its power can never be used again. Everyone begs him not to, as the Genie will be lost forever. Happily, Scrooge had his own alternative solution all along. Non-Serial Movie: The events of the film are never mentioned again in the series, although Scrooge recognizes Dijon when he appears in several episodes that aired shortly after the film's release (two of these episodes were the show's actual Series Finale). No Ontological Inertia: When the genie is made a real boy and thus de-powered, Dijon (who had been transformed into a pig from a wish by the Big Bad) is restored to normal. Not-So-Harmless Villain: Dijon spends the whole first half of the movie as a snivelling pick pocket and toady to Merlock. When he succeeds in finding the lamp, Genie convinces him to keep it for himself, assuming he would do far less harm than Merlock. That's accurate, but it turns out that there's a lot of headroom below "less harmful than Merlock." He proves to have more of a mean streak than the Genie bargained for; he wishes for power and fortune, specifically Scrooge's, and arranges the latter to be thrown in prison and his family out on the streets. Oh, Crap! : While going through the laser hallway, a stray laser ripped the directions in half and leaves Louie (and cockroach Merlock) in a predicament (Merlock's horrified gasp says it all). Louie gets his tail feathers scorched and is thrown back to the start again. Everyone (but especially Dijon) when Merlock finally gets hold of the lamp. Ooh, Me Accent's Slipping: Christopher Lloyd's voice at times slips into an accent that sounds like either a softly rural English accent or a vague, nondescript European intonation. Ominous Floating Castle: Merlock uses the Genie's magic to turn Scrooge's money bin into a Floating Castle that is very ominous. It's not floating by design though; Merlock specifically wished to "return home in his new home". Scrooge just defeats him before they get to the destination. One-Winged Angel: Merlock can change into any form he wants (usually a bird of prey), but at the climax he changes into a gryphon to pursue Scrooge. Reactive Continuous Scream: When Mrs. Beakley first sees the elephant that Webby wished for, she screams and the elephant screams back at her. Reset Button: There are three of these in the movie, and all of them are counter-wishes to erase bad wishes the Genie was forced to grant. The first two are at the mansion with two of Webby's wishes (the first one for a baby elephant, and the second one to bring her stuffed animal collection to life) that make the result of her wishes disappear, with the lamp then going into Scrooge's possession afterwards. The third Reset Button wish, however, erases all the negative wishes forced on Scrooge and his family by Dijon and Merlock in the third act of the film. Say My Name: Scrooge yells Launchpad's name when the pilot falls off the pillar. 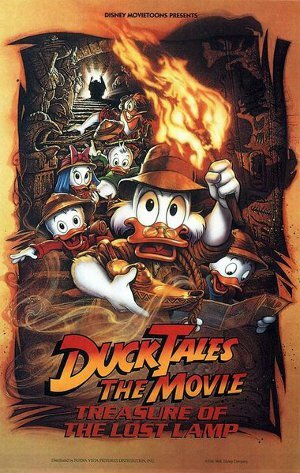 Secondary Adaptation: A Non-Serial Movie based on DuckTales (1987), which itself was invented from the comicbook series (Disney Ducks Comic Universe) pioneered by Carl Barks. Selfless Wish: At the end of the movie, Scrooge uses his last wish to give Genie the one wish he's ever desired - to become a real boy. Since this is Scrooge we're talking about, it doesn't get more selfless than this. Spanner in the Works: Webby taking the lamp from Collie Baba's treasure trove. This stopped Merlock from getting Genie after stealing the treasure from Scrooge. Spikes of Villainy: Merlocks fortress is covered in these. Sue Donym: The kids name the Genie "Gene" when Scrooge first finds him and they're pretending he's a boy. The movie poster and cover are clearly inspired by the Indiana Jones, and Indiana Jones itself was inspired by Carl Barks' Duck comics. Dijon tells Merlock that, when he gets the lamp, he will become "More powerful than locomotive! More faster than speedy bull! You can leap tall buildings in a single town!" Sorcerous Overlord: Merlock. It's not stated explicitly what possessions he ruled over, but he's an Evil Sorceror who used Genie to spread terror and fear wherever he wanted. His dark floating fortress at the end wouldn't look out of place as Sauron's residential palace. Spanner in the Works: Scrooges obliviously gives Webbygail the lamp, leading it to be left out of the treasure sack when Merlock tries to steal it and Genie left in Scrooge's possession. Super-Speed Reading: Genie reads an entire encyclopedia in ten seconds. The Starscream: Invoked by Genie, who convinces Dijon to keep the lamp and wish for his own fortune rather than turn it over to Merlock for a reward. It goes horribly right. Three Wishes: What the Genie gives all of his masters. Merlock however has a talisman that allows him to override the three wish rule. Unfortunately, wishing for possession of the talisman is the one wish beyond the genie's power. That and wishing for a million wishes and peace and happiness all over the world. Genie: Get serious, that never works. Hey, these are wishes, not miracles. Throne Made of X: In the climax, Merlock has a throne made of gigantic thorns. Trouser Space: Dijon hides stolen goods in his pants. However, this is not Hammer Space, as if he overdoes it, what he's stealing becomes noticeable. Scrooge: Somebody! Stop those pants! Undying Loyalty: The kids and Scrooge's staff throw every cent they have into making bail after Dijon has Scrooge dragged off to prison, despite the fact that Scrooge has lost everything and can't repay them. Villain Ball: Genie convinces Dijon to keep the lamp for himself rather than turn it over to Merlock. However Dijon ends up more cocky and malevolent than Genie had bargained for, using his wishes to steal Scrooge's fortune and home, and ignoring Genie's pleas to evade Merlock until him and Scrooge track him down, earning him an unpleasant comeuppance from Merlock. Voluntary Shapeshifting: Merlock transforms into a variety of (non-anthropomorphic) animals. Wasn't That Fun? : Scrooge and company take a wild ride down a raging underground river under a wicker basket in order to get out of the treasure trove of Collie-Baba. Once it's all over, Louie says "I wouldn't mind doing that again, now that I know you can live through it." Wasteful Wishing: Most of the nephews and Webby's wishes, combined with the Three Wishes trope. Scrooge however takes the potential of a genie far more seriously. Scrooge: I could wish for the world's biggest diamond. No, the biggest diamond mine! No, ALL' the diamond mines! No! The entire mining industry! Yes! Yes! Yeeeeees! ...I can see how this is going to take some careful thought. Wham Shot: Although it goes unnoticed by Scrooge and Launchpad, we can clearly see Dijon's name on the money bin when the duo returns to Duckburg; Scrooge's shock when he's dragged back out by security and finally takes notice of this is quite understandable. What Happened to the Mouse? : Although Dijon goes on to appear in the TV series, Genie/Gene is never seen again (ironically Merlock, who has a reason not to reappear, DOES return for a couple video game appearances down the road). In the movie itself, Mrs. Beakley isn't seen again after she faints away from seeing Merlock transform the money bin into an Ominous Floating Castle. Launchpad also never appears again after the plan to infiltrate the Money Bin begins; he's last seen flying Scrooge above the bin so he can parachute onto the roof. Wishing for More Wishes: Genie has the standard Three Wishes limit, and when asked if one could wish for more wishes, he answers "Get serious, that never works." However, the Big Bad Merlock has an amulet that, in combination with the titular lamp, does grant him unlimited wishes. Launchpad: Well, it could've been worse. It could've been somethin' new!